I don’t think I’ve recommended a work of fiction before in this series, which is odd given that I read a lot of fiction and I think a lot it is relevant to the themes discussed on this blog. 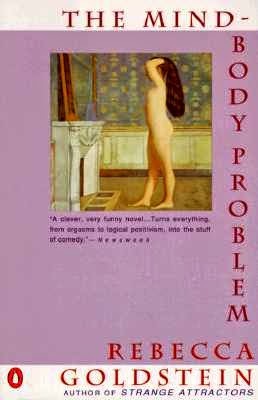 So I am going to break the mould and actually recommend one this week: The Mind-Body Problem by Rebecca Newberger Goldstein. There is no particular reason for recommending this book — I certainly don’t think it is life changing or anything like that — but it happened to be the novel I read most recently, and I thought it was clever and enjoyable. Goldstein, as some of you will know, is a philosopher-turned-novelist-turned-non-fiction author. Her most recent book is Plato at the Googleplex, which I also happen to be reading at the moment. I thought I might hate that book given the gimmicky premise (imagine if Plato somehow got transported through time into the 21st century), but it’s actually quite good, mixing history with Platonic-style dialogues. I’ve also read one of Goldstein’s previous novels 36 Arguments for the Existence of God, which I liked in places but found disappointing overall. Anyway, I think The Mind-Body Problem is a much better novel. It was, in fact, Goldstein’s first and was published way back in 1982 (I know that’s old because it’s before I was even born). It tells the story of Renee Feuer, a young woman from an Orthodox Jewish background, who goes to Princeton to study philosophy, falls in love with a famous mathematical genius called Noam Himmel, gets married, and then proceeds to have a couple of extra-marital affairs. That plot description doesn’t do it justice though. The real strength of the novel lies in the “voice” of the main character and the way in which she weaves various philosophical reflections into her description of the events. The central philosophical reflection, of course, being on the mind-body problem, which in the context of the novel has to do with the life of the mind (represented primarily by Renee’s husband, the genius mathematician) and the life of the body (represented primarily by Renee herself and her various sexual dalliances). The novel is certainly not for everyone. If you like the so-called “literary”-style, and satirical observations on the occasional absurdity academic life, then you’ll probably enjoy it. And I do think Goldstein has a real gift for working some interesting philosophical ideas into her narrative (based on the two books I have read). This might be of interest to people who like “novels of ideas”. One thing I couldn’t get past when reading it, however, was its quasi-autobiographical nature. Goldstein actually jokes about this at one point: there’s a throwaway line about how female novelists tend to write autobiographical first novels. But it is kind of interesting how many aspects of Goldstein’s real life are shared by her fictional counterpart (Renee): both come from strict Orthodox Jewish backgrounds; both studied philosophy at Princeton; both married older, more established, academics when they were quite young. It does make you wonder how much else is true.